We like to be an active part of communities across New Zealand. We believe we’ve got a responsibility to give back to our local communities. Every year we help set up and support sporting, educational, charitable and environmental programmes designed to help a wide range of people and communities. If you are interested in support for your school, club or organisation, please read our sponsorship information and apply online to get support. McDonald’s® has been an active part of New Zealand communities since 1976, and we are proud of the positive contribution we make. Our restaurants and franchisees play pivotal roles in their local area, and we take our responsibilities seriously to make sure we are a good neighbour and a good corporate citizen wherever we go. To find out where your nearest McDonald’s is located click here. Visit our sponsorship section if you’re looking for sponsorship or support from your local restaurant. McDonald’s New Zealand established an annual sponsorship programme with the Auckland University of Technology (AUT) in 1993. The primary aim of this scholarship is to extend education opportunities to Maori students from the Northland region, who may otherwise find it difficult to pursue a tertiary education. Together with AUT, McDonald’s has helped 69 students to attend AUT, with 35 graduates and 15 students currently studying. 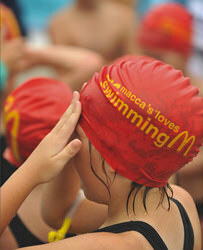 McDonald’s is a global sponsor of the Olympic Games movement, including both summer and winter Olympics. In 2008, to support the Beijing Olympics, McDonald’s undertook what turned out to be one of the biggest physical activity programmes New Zealand has ever seen. More than 100,000 free pedometers were distributed to 94,000 children from New Zealand primary schools. They took more than three billion steps, walking more than 1.6 million kilometres, and learned about New Zealand’s proud Olympic history at the same time. We receive lots of great ideas on how we can get involved in various types of events. To best present your proposal, read the guidelines below to see if your idea meets our criteria, then apply for either a local or national sponsorship. We want to deliver valuable benefits to our customers and the wider community. We are especially dedicated to providing children with ways in which they can live balanced, active lives. Our sponsorships must reflect a grassroots and community focus. Where possible, local sponsorships should be referred to your local restaurant manager or franchisee. We will do our very best to respond to your proposal within two weeks of receiving it. We prefer to receive submissions by email.